When a business purchases some or all of another company’s assets and offers the seller’s employees new, but substantially similar employment contracts, is that adequate consideration? In order for a contract to be enforceable, it must involve the exchange of lawful ‘consideration’. Lawful consideration is anything of value, tangible or intangible, that may be transferred in exchange for something else of value. There must be mutual consideration between the parties to a contract. For example: in exchange for your promise to cut my lawn, I promise to pay you $25. An offer without reciprocal consideration is a gift and will not be enforced by a court. The question of consideration arises in the employment context when a buyer makes an offer to a seller’s employees. Does an offer of continued employment from a buyer constitute ‘consideration’ such that the new employment contract is binding on the employee? The Court of Appeal for Ontario addressed this question in its decision in Krishnamoorthy v. Olympus Canada Inc.
Krishnamoorthy commenced employment with Carsen in May 2000. In 2005, an unrelated company, Olympus Canada (“Olympus”), purchased most, but not all, of Carsen’s assets. Olympus offered employment to 122 of 125 Carsen employees, one of whom was Mr. Krishnamoorthy. Olympus made a written offer to him, the terms of which were substantially similar to those he had with Carsen with certain exceptions. In particular, the written offer included a termination provision that limited his entitlements on termination. Mr. Krishnamoorthy accepted the employment offer from Olympus. His employment with Carsen ended on July 31, 2006 and he started with Olympus the next day. On May 19, 2015, Olympus terminated his employment without cause. On termination, Mr. Krishnamoorthy argued that his employment with Carsen and Olympus was continuous pursuant to section 9 of the ESA and that, as a result, the termination clause set out in his written employment agreement was unenforceable due to lack of consideration. Specifically, he argued he did not receive anything “new” in exchange for entering into the contract. In response, Olympus argued that it had no legal obligation to offer employment to the employees of the vendor so, because of that, the offer of ongoing employment was the “new” item being offered which was sufficient consideration and the termination clause was binding. The Court of Appeal agreed with Olympus and held that, while it is established that a promise to perform an existing contract by the same employer is not consideration (i.e. new or additional consideration is required to support a variation of an existing contract), cases where an employee is given a new employment contract by a new employer (i.e. upon purchase of company assets), were different. In the latter case, the offer of employment by the new employer did amount to adequate consideration and so the termination clause in the new contract was binding. Always ask: What’s the “give” in exchange for the “get”? – Whether in the context of a sale of a business or otherwise, employers must always ask themselves the question: What am I giving this employee that they don’t already have in exchange for getting a new signed agreement? If the answer is nothing, the agreement won’t be binding. The offer of employment is the “give” in an asset purchase – In the context of an asset sale, the offer of employment from the Purchaser to the vendor’s employees is the “give” (or in other words, the consideration). So, absent any other problems with the contract, it will be binding, and the purchaser will enjoy its’ protections. 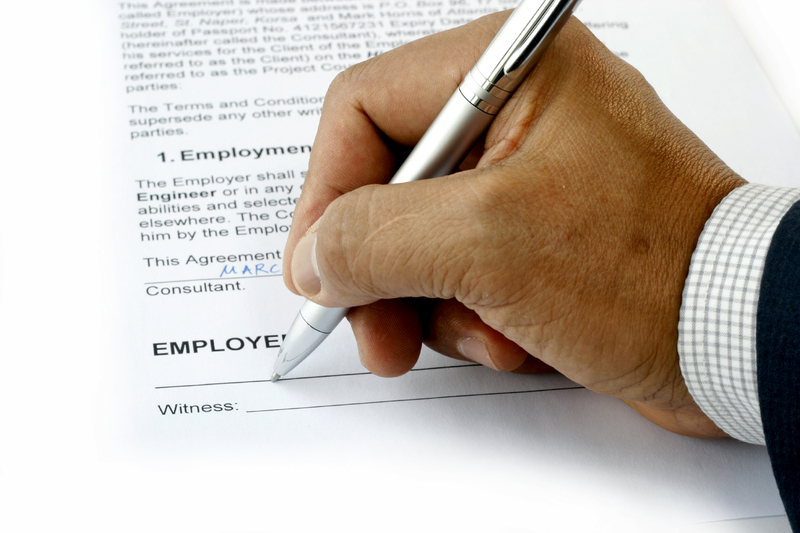 Make sure the actual contract terms are enforceable – Even though the actual offer of employment is enough consideration to make the contract binding according to the Krishnamoorthy case, make sure that the terms in the contract are themselves legally compliant – especially the termination clause. You don’t want to have gone through all the trouble of having new contracts signed, only to find that the actual terms contained in them are invalid. Purchasers buying assets of a vendor don’t have to hire the vendor’s employees – There is no legal requirement that a purchaser in the context of an asset purchase offer employment to the existing employees of the vendor. If the purchaser doesn’t want the employees, it can leave them behind and their termination liabilities will rest with the vendor assuming the asset transaction contract does not say otherwise. This is totally contrary to what was deemed to be the rule of law regarding employees caught up in a business in a bankruptcy to acquisition in ontario in Y 2012. At that time the employees who were carried forward into the new owner’s company, which carried on exactly the same operation and business from the same location as the initial company, did so with loss of some benefits but carried forward their years of service credits towards vacation entitlement and future severance. So i am confused by this present decision in this article.